The other project I spent finishing up last weekend was putting the edge finishes and tabs on some new pages for my Fabric Embellishing sampler. When we were writing the book Fabric Embellishing; the Basics and Beyond we didn't have time to make pages for some of the techniques that one of the other author's was writing so Ruth and I have been going back and creating some of those with variations from the originals in the book. A lot of the pages that I didn't get done previously were in the 'foundations' section of the book. This one featured above is weaving. Here we have tucks. Don't you just love the mini pom pom trim? I had a lot of fun with this page seeing how this striped fabric would look tucked. This is my Stitches and Bits page. I skipped the stitch part and just inserted lots of bits. The yellow strip is plastic kitchen lace (you know the stuff your produce comes bagged in). Just remember not to iron it! This is my vintage take on the Fashion a frame page. I used a beautiful piece of silk paper in the windows and some vintage bits that seemed to be treasures the young woman in the photo would have kept. I used a hand dyed vintage tea towel for the base and added quite a bit of hand stitching. This page was a sample that didn't make it into the final cut of Fabric Embellishing. It is a combination of paper, fabric and kitchen produce lace layered. The strips on the left are from a piece of sequin waste that I cut, overlapped and stitched down by machine. The edge finish is pieces of purple produce lace couched down around the edge. I love the little top piece that sticks up straight on the top. Not my Christmas list....my to-do list! Last weekend found me in Breckenridge on a girls quilt weekend and I am so excited to say I finished some things that have been patiently waiting in the studio for me to return to them. The piece above is titled Connections. It is a gelatin plate mono-printed fabric which has been embellished with hand stitching. I began this piece with a self-challenge to use my least favorite piece of mono-printed fabric. I love the results. As I was stitching away on it, I found that I kept adding texture in blending colors that are difficult to see. My stitches added subtle texture rather than bold designs. I couldn't seem to change that. One really has to look closely at this piece to discover all the elements. As I continued stitching my barely noticeable stitches I kept thinking of the wonderful friendships in my life. How often the most calm and understated people are the ones you can rely on when the chips are down. The circles tell the story of friends who bring people together in big and small ways. So, my 'ugly' mono-printed fabric became a rich and meaningful piece of art for me...a piece about connections and friendships. Tomorrow I will show you all a quilt that is about as opposite from this as you can get. Ruth is well known in local circles for her wonderful garments. Growing up tall in a place where most women are much shorter, Ruth learned at an early age to make her own clothes. Even finding patterns was difficult so she quickly learned to adapt them to her unique style and taste. Of course Ruth loves to embellish her clothing and almost always adds some personal touch to even her purchased clothing. Ruth and I share a passion for hand stitching and embroidery...we love the texture and design element it adds to any project. In fact Ruth is working on her next book which explores her 'what if...' approach to hand stitching. Don't be thinking staid old embroidery book though! Ruth loves nothing more than shaking things up with deconstructing, distorting and otherwise abusing stitch patterns. Her Stitch Play class gives an exciting peek into what this book will encompass. Ruth is working on a new take on the stitch sampler in a small book format...it is really cool! Stay tuned for photos on that soon. But in the mean time you can get a hint of what I am talking about in these photos. You can click on them to see more detail. Ruth has been making a ton of bags and totes lately...you will see her awesome computer bag in the Fall issue of Quilting Arts Gifts! I am happy to have two of her originals as my new purse as well as a computer bag for my notebook! If you will be at the Long Beach Quilts Inc show be sure to get to our Cloth Paper Scissors~Make It University class called: Where did you get that bag? The prototypes below will see a few adjustments as we re-size it to fit your tablet or book readers! Ruth and I are your co-hosts for the Fabric Embellishing: Basics and Beyond free book study which can be found on the forum. 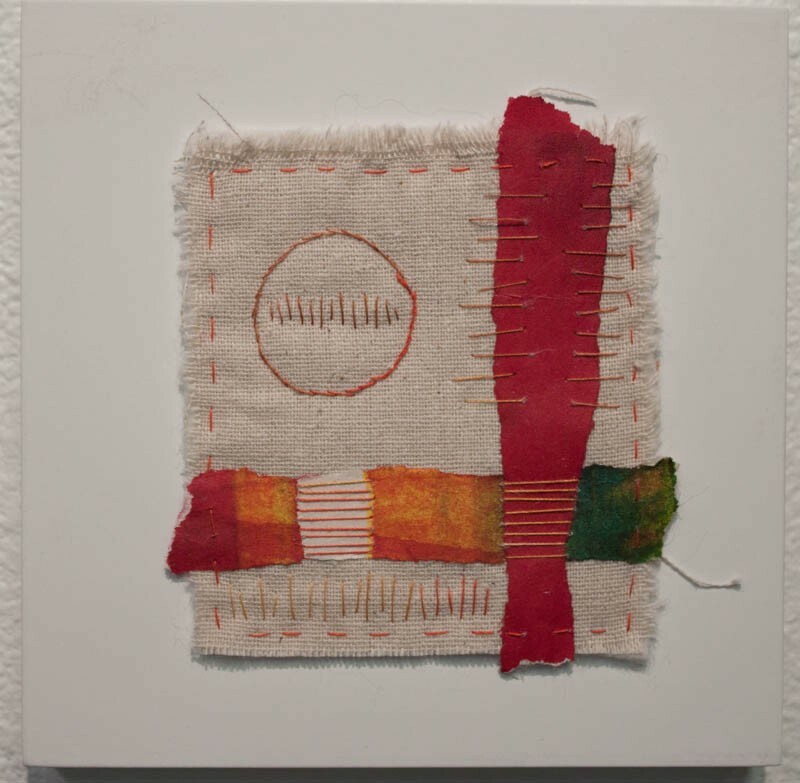 Read more about Ruth's fiber art adventures on her new blog. Is this a riot or what? Tico took my Bodacious Beading class on line at FAMM. I accept full responsibility for creating yet another bead addict! The new round of classes are posted on FAMM and there are more teachers this quarter. Head on over to check out the great line up of classes that you can take in your PJs...I love on-line classes! I am not teaching Bodacious Beading this quarter though...you will have to wait until the new year. But, I am teaching my fantastic According to You class! I love this class and it is everything I wish I had known when I first started working with collage. The timing is great too because these mixed media memory books make awesome holiday presents. You don't have to make a book in the class, you can make a wall hanging if you prefer. I have been catching up with sleep, chores and some fun projects since the retreat. This collage is one of my fun projects. I love this image. There are a variety of mixed media techniques in this piece. I really enjoyed it's creation...especially all the hand work. Hand stitching is so relaxing for me. I never get tired of collage. Isn't that hand dyed paisley fabric great? Another one of my treasures from Artist Artifacts. Judy, the brilliant talent behind Artistic Artifacts, creates the most luscious hand dyed fabrics. I tried my hand at some low water immersion hand dyeing this weekend with some great and some not so great results. I will have some photos later...I am still rinsing out fabric. Judy certainly doesn't have to worry about fewer sales from me though...my stuff isn't any where as good as hers. Practice certainly makes for more beautiful dyed fabric. Plus hand dyeing is a LOT of work. I was exhausted! I had a self decreed ‘slow weekend’. My immune system is on hyper alert again so that means it is time for some self care and relaxation. I have a high tolerance for stress so my body has to take matters into its own hands when I don’t realize that I need a break. It can be frustrating to have my body rebel like that but if I wasn’t so dense and learned how to go a little slower it wouldn’t have to have such a radical defense system. Thank goodness my body is smarter than my brain! Saturday was the monthly ATC meeting and this month’s theme was travel. I love my ATC group. Everyone always has a different take on the theme and there is always at least one person who really has the creative juices flowing and blows us away. I think I have told you all before but I will tell you again…having a small group like this is wonderful for a creativity jump start and it is fun to boot! We share techniques and stories, sometimes the stories behind the finished product are more inspiring than the art. It is easy to set up an ATC group. You just need a place to meet, a few guidelines and a few brave playful souls. Our guidelines are simple: we work primarily in fabric but paper is acceptable, we have a theme every other month with the off months being open and we are always kind to each other…no negative remarks. It is an open group so if you are in my area drop by and check us out. I did a little stitching on one of my printed fabrics from a week ago...some 'slow cloth'. I love combining hand and machine stitching to get layers of texture. I find both types of stitching to be therapeutic and calming...perfect for those times I am supposed to be relaxing but have the itch to do something with my hands. Anyone else have problems relaxing? I have this compulsion to work all the time. I love what I do so that is part of the reason but I think the rest is just part of my personality…I have always been one to keep busy and the world if full of wonderful things to do. This is the final piece for the technique I demonstrated for Quilting Arts TV at my taping earlier this month. The show will air this summer. I am not sure when but i will be sure to let everyone know. This technique is also in Threads: the Basics and Beyond which will be available in May. I love this technique which combines free motion machine embroidery and hand stitching. I struggled with how to present this piece because it was overwhelmed by quilted background, which is one of my standard methods of showcasing these embroidery pieces. A painted canvas was too stark. I finally hit upon this idea. The canvas is loosly wrapped with a sheer fabric. I tried wrapping it tightly but that didn't 'fit' either. This piece wanted to have a soft resting piece. I used Misty Fuse to fuse the sheer fabric to the back of the canvas. The Misty Fuse worked perfectly. I like how it turned out and may try it again on future pieces. I don't have a name for this piece yet. Usually names come to me as I work on a piece and I worked on this one a long time with all the hand stitching but the 'just right' name hasn't come forward. Let me know if you have any ideas!